The Guadalupe River that flows through Texas used to be known as The River of Nuts, a fact that Wikipedia does not confirm. The nut in question is the pecan, Carya illinoinensis, and the pecan tree is the state tree of Texas. The groves of wild pecans that lined the rivers of Texas are, however, threatened by the very popularity of the nuts they bear, and in particular by the fickle global nut market. The Chinese, you see, have gone nuts for pecans, increasing their purchase of American pecans from 3–4% in 2006 to 30–40% today. And if they abandon the pecan as quickly as they took it up, the wild pecan groves might be abandoned too. All this, and much more, I learned from James McWilliams, professor of history at Texas State University. His new book is one of those delights that looks at the global sweep of human endeavour through a little lens, in this case the pecan. Why it was the Chinese, rather than the French, the English or some other country, that chose to absorb the pecan surplus, I guess we’ll never know. McWilliams told me that Chinese people he spoke to believe the nuts prolong life; irrational as that may seem, no American grower is going to say they don’t. And while the high prices are good news for growers, they’re not so good for people who want pecan-containing industrial food. 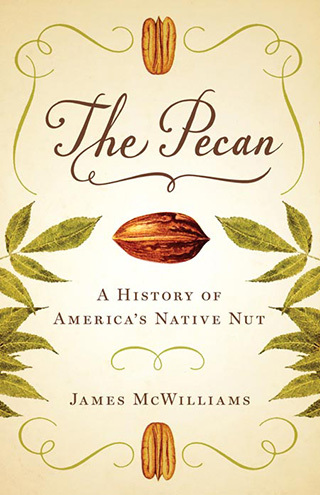 James McWilliams’ book is The Pecan: a history of America’s native nut. There’s an extract in Texas Monthly online. Outro music Pecan Pie by Golden Smog. I was born and raised in Oklahoma. I love pecans, especially making pecan pie around the winter holidays. I Remember my Grandmother used to love to go and pick up pecans. A few years ago I owned a house that had a large, old pecan tree in the back yard. One year (of the 6) I owned this house we got a bumper crop of pecans from it. We enjoyed them and shared them with family and friends. Pecan trees only produce every 2 years. And one problem they often face is that worms will invade the pecan trees and ruin the crop of pecans. So unless you take steps to protect the trees you may not get a crop. Chickens can help by eating the worms. We did not have chickens or spray the tree and so were lucky to get one good crop of pecans. Pecans are good in a number of baked goods from cookies and brownies to topping cakes, putting into or on ice cream is a favorite. They are very desirable to have around.